As promised, excerpts of my master’s dissertation will be published on Nippaku in an adapted version. This post will give an outline of the problem concerning mental health stigma. First, I will discuss the causes and consequences of stigmatization against people with a mental disorder in general and then focus on the specific situation in Japan. Interested in more mental health posts? Check out Iwakura: the Japanese Gheel (Mental Health in Japan Series no. 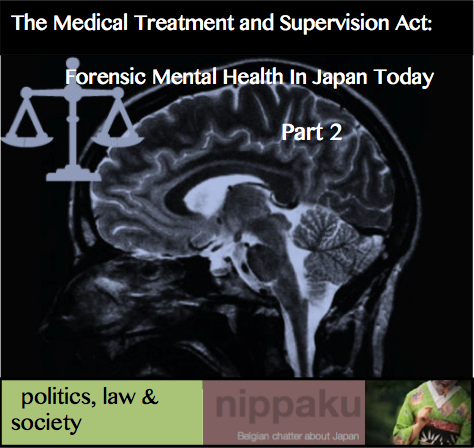 1) or The Medical Treatment and Supervision Act (2005): Forensic Mental Health in Japan Today – part 1 and part 2. From various studies, we can conclude that stigma against individuals with a mental disorder is a real and serious problem worldwide. First of all, people with a mental disorder often experience discrimination in housing, education and employment. Not only does stigma influences the negative attitude of others who are otherwise unrelated to the health care industry, it has been proven that mental healthcare workers as well take a stigmatizing stance towards their patients. Moreover, high-quality primary care and non-pharmacological care is often not sufficiently provided, which contributes to a pervasive experience of stigma. Apart from its social consequences, stigma also affects the patient on a personal level. Causing a loss of confidence and a further worsening of the emotional state, stigma has been called “the second illness”, because its effects are sometimes as harmful as the disorder itself. Another critical problem is that stigmatization interferes at every stage of the process towards recovery, i.e. during diagnosis, treatment and rehabilitation. Due to social stigma, mental health patients are much less likely to seek psychological help immediately, agree to treatment or return to society after having spent time at a mental institution. This self-stigmatizing attitude (the internalized type of stigma towards oneself) forms a real barrier to optimal recovery, and is one of the main challenges in the field of mental health care today. Stigma is visible in various types of negative attitudes and prejudices. Moreover, the mentally disordered have been stigmatized throughout history. Contrary to people diagnosed with a physical illness, those with a disease of the mind are often regarded as irresponsible, weak and blameworthy, as if they hold responsibility for their own illness. This stigmatizing attitude is reflected in the fact that not even 60 percent of surveyed states by the WHO had a dedicated mental health policy in 2011, and only 68 percent provided a mental health plan or legislation in 2014. Additionally, stigma against people with a mental disorder is often promoted by false information in the media and entertainment industry. Not uncommonly, mentally disordered offenders are sensationally reported in the news, and by emphasizing the mental state of the offender, individuals with a mental disorder in general are labeled as inherently dangerous. Stigma takes further concrete shape in derogatory terms and expressions based on such a discriminating attitude like “psycho”, “freak” or “nuts” . Another prevalent prejudice is that “mental health problems are untreatable”. According to a study by Lebowitz and Ahn, who had participants read vignettes emphasizing the treatability of mental disorders, stigma can be reduced by providing correct information on mental disorders. Jorm et al. point out that the increase of public knowledge about depression leads to more recognition of the mental disorder, and in particular stimulates positive beliefs about treatment and the benefits of help-seeking. In other words, it has been demonstrated that in order to deal with stigma, it is necessary to tackle the root problem, ignorance, first, which resulted in a sharp increase of campaigns focusing on “mental health literacy” in the last two decades. For example, Crisp et al. compared the attitudes toward people with different mental disorders before and five year after the Changing Minds campaign in Great Britain. One of the improvements they reported was a reduction in the percentage of stigmatizing opinions. On the other hand, mental health literacy campaigns should be continued on a long-term basis in order to achieve a sustained change. There is, however, the possibility that negative attitudes do no change for the better, even if the public mental health literacy clearly increases. Ando et al. reviewed nineteen surveys related to mental health stigma in Japan. They reached the conclusion that Japanese people in general have the tendency to regard mental disorders as untreatable diseases, caused by weakness of personality rather than by biological factors. Other studies show that the stigmatization of mental patients in Japan is stronger than in Taiwan, Australia, Bali, but not as strong as in China. Research on stigmatization of schizophrenia shows that the Japanese respondents heavily emphasize the “dangerousness” and “abnormality” of patients, a far more negative attitude than the British respondents. Additionally, these kind of prejudices are not limited to a specific age or environment, as they have been found prevalent among young Japanese people and the rural Japanese population in contrast to other nationalities. We can conclude from the study results described here, that, in general, the tendency to stigmatize people with a mental disorder is relatively strong in Japan. 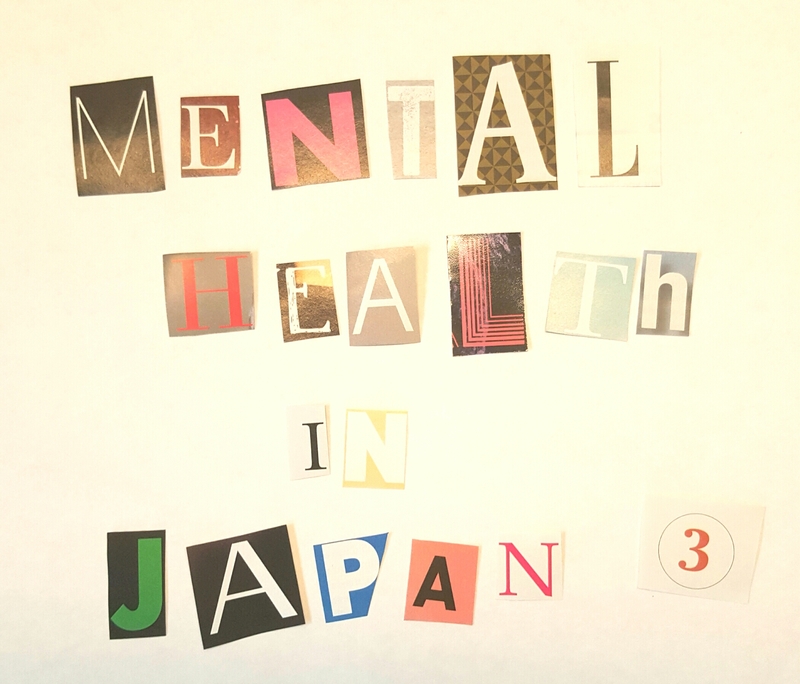 Example of a Japanese mental health stigma campaign. One Japanese study demonstrates the close relationship between correct knowledge or information and social distance from individuals with a mental health problem among young people, in the sense that correctly informed youngsters took a less negative attitude towards the mentally disordered. For that reason, mental health campaigns in Japan as well have been designed to deepen the understanding of the general public, and an increase can be noticed in television soaps and programs featuring people with a mental disorder without stereotyping them. A further indication of efforts to reduce stigma is the decision in 2002 to change the word for “schizophrenia” in Japanese from seishin bunretsu byō 精神分裂病(“mind-split-disease”) to tōgō shicchō shō 統合失調症 (“comprehensive imbalance disorder”), the former expressing a lack of personal autonomy and thus contributing to a stigmatizing attitude. According to a survey on dementia conducted in 2004, older people in Japan hold a slightly more negative opinion compared to younger people. When the same survey was repeated in 2007, the researchers found a reduction in stigmatization by the older age group against people with dementia. Nevertheless, the same survey found that dementia is still strongly regarded as an “untreatable” and “shameful” disorder by Japanese people. What affects the Japanese attitude even more directly, is the widespread prejudice that “people with a mental disorders are a danger for society”. According to the most recent data from the Ministry of Justice, “the ratio of offenders with a mental disorder is 1.5%, but looking per offense, the ratio for arson (17.4%) and manslaughter (12.8%) is high”. Certainly, we cannot deny the fact that among offenders of serious crimes like arson and manslaughter, the ratio of offenders with a mental disorder is rather high. However, the total ratio of mentally disordered offenders is only 1.5%, which makes a general judgment like “inherently dangerous” far from applicable to all people with a mental disorder. Furthermore, Link et al. state in another study that, although it is correct that mental patients are generally more prone to use violence, the excess risk of violence due to the factor of a mental disorder is rather modest in comparison with other factors. As a result of the prejudice linking mental disorders to violence, people with a mental disorder often experience segregation and isolation. Based on this false assumption, mental health patients themselves and their families generally believe that in case of a mental disorder, it is better to be hospitalized for a long period than being rehabilitated into society. This preconception is clearly reflected in statistics showing that Japan has not only the most hospital beds in general, but also the most beds for psychiatric patients worldwide (fig. 1 and 2). figure 1 source: OECD. Health at a Glance 2015 OECD Indicators. Paris: OECD Publishing, 2015, p. 105.
figure 2 source: OECD. Reviews of Health Care Quality: Japan 2015 ; Raising Standards. OECD Reviews of Health Care Quality. Paris: OECD Publishing,2015, p.172. Along with a maximum number of psychiatric beds, another indication of the emphasis on inpatient settings in Japan due to a strong stigmatization, is the average length of stay for psychiatric patients of 377 days in 2000 and 298 days in 2011, an extremely long hospitalization period compared to the OECD average of 36 days (fig. 3). figure 3 source: OECD. Reviews of Health Care Quality: Japan 2015, p. 172. Despite the fact that the number of psychiatric beds and the length of hospital stay for psychiatric patients has been decreasing, mental health care in Japan still faces a number of challenges in order to be able to make the step towards “deinstitutionalization” . In Japan, however, “the community-based infrastructure remains underdeveloped with relatively low numbers of staff working in the community, and low numbers of supportive housing facilities, coupled with a strong emphasis on physical treatment rather than psychosocial treatments”. It seems likely that the delay of an out-patient setting such as community-based care in Japan is partly rooted in the strong social stigma towards psychiatric patients because of the difficulties they face regarding reintegration. Stigma is also believed to play a role in the high suicide rate in Japan (18,7 per 100,000 population in 2013). 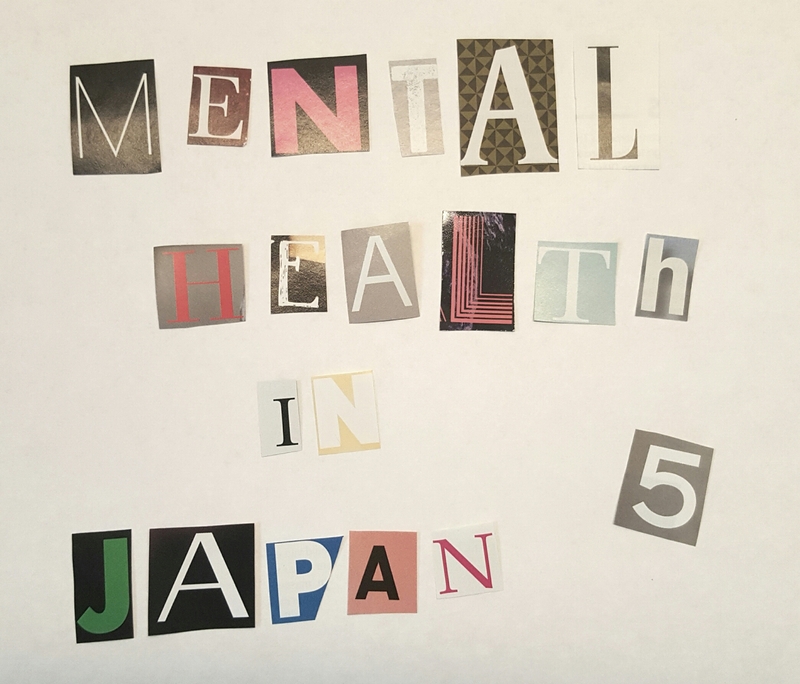 Despite a decreasing rate from 2000 on, many Japanese struggling with mental health problems still fail to seek medical help due to the mental disorder taboo. Furthermore, the phenomenon “hikikomori”, adolescents and young adults withdrawing from society to extreme extents, has recently called attention to the mental wellbeing of the younger generation in Japan. A study revealed that in 2011, 1.2% of Japanese people aged 20 to 49 identified with hikikomori. This phenomenon can be linked to (self-)stigmatization. Additionally, it has been revealed that many victims of the Great East Japan earthquake in 2011 suffer from mental health problems, which urges the rethinking of an accessible community-based mental health care system. Considering the serious effects of social stigma, it is clear that this problem has to be dealt with in order to improve the challenging situation of individuals with a mental disorder. In the previous post, I wrote about the historical events that prompted the implementation of the Medical Treatment and Supervision Act of 2005. In this second and last part, we will see what changes the most recent Act on forensic mental health brings about, and what problems it has already met. The revised Mental Health and Welfare act of 1999 scheduled a reform in 2004, including a new legislation for mentally ill offenders (Kunihiko, 1999). This reform should address the lack of security in mental hospitals. Indeed, no special provisions existed concerning the hospitalization of mentally diseased offenders. Moreover, the concept of “forensic health” originated in Europe and was never discussed before in Japan (Satsumi & Oda, 1995). This issue received public attention after a janitor, suffering from personality disorders, stabbed 8 children to death in the Osaka school massacre in 2001. 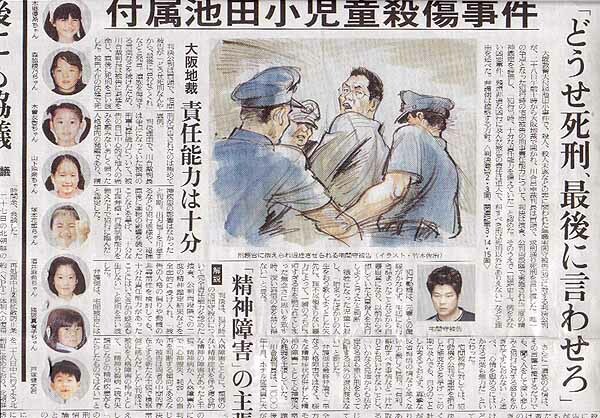 When it became known that the offender had a criminal record, the public opinion called for a legislation concerning the treatment of the mentally ill and recidivists in particular (Fujii, Fukuda, Ando, Kikuchi, Okada et al., 2014). The Ministry of Justice issued a briefing report, aiming at the integration of forensic inpatient and outpatient services, provided they were strictly controlled. The report also included the necessity of a mentality change towards the mentally ill (Weisstub & Carney, 2005). In 2002, a new Bill for the Medical Treatment and Supervision Act was introduced to the Diet (Nakayama, 2005). The bill was proposed by the government and supported by the Japanese Association of Psychiatric Hospitals. The emphasis on the prevention of re-offending (再犯の恐れ), however, triggered criticism from the parties involved (Moriya & Ujiie, 2008). The bill stipulated that only those deemed prone to recidivism were suited for hospital treatment. More than 20 organizations objected that future criminal intentions could not be predicted (Nakatani, Kojimoto, Matsubara & Takayanagi, 2010). 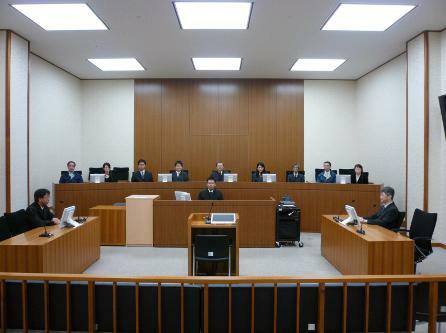 The Japan Federation of Bar Associations warned that it could “bring about violation of human rights”. The Bill was passed in 2003 and implemented on 15 July 2005 as The Medical Treatment and Supervision Act, short for the Act for the Medical Treatment and Supervision of Persons with Mental Disorders Who Caused Serious Harm. This time, the word for ‘fear for re-offending’, was left out and replaced by euphemisms in the Act, because it echoed the traditional emphasis on maintaining public order (Fujii et al., 2014). Q&A manual about the MTSA by the Japanese Federation of Bar Associations. The purpose of the Act is threefold: stimulating rehabilitation, improving accurate treatment and preventing recidivism (Nakatani, 2012). Whether a mentally ill offender will be treated or not, depends on three criteria (Guidelines for Psychiatric Evaluation). Firstly, the nature and severity of the mental disorder and its link with the crime; Secondly, the treatability; thirdly, the existence of factors that could interfere with the rehabilitation. If all three criteria are met, the mentally ill offender is designated a treatment order. The Medical Treatment and Supervision Act, however, only applies to mentally ill offenders who committed a serious crime: homicide, robbery, bodily injury, arson, or a sexual crime (Nakatani & Kuroda, 2013). Other crimes are regulated by the Inmates and Detainees Act or the Mental Health and Welfare Act. Between 2005 and 2012, there were 2,750 requests for treatment according to the Medical Treatment and Supervision Ac of which 63.1% received an inpatient treatment order (Fujii et al., 2014). Inpatient treatment includes three stages: acute, recovery and rehabilitation (Nakatani et al., 2010). The expected length of stay is 18 months but can be prolonged, which happened in more than 33% of the cases in 2011 (Nakatani & Kuroda, 2013). By December 2007, 14 designated inpatient facilities were attached to public psychiatry hospitals in Japan (Matsubara, 2008), by 2013 there were 30 facilities, or 791 beds available in the whole country (Fujii et al., 2014). 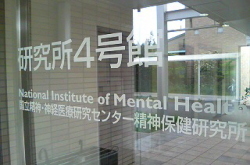 Two of the four medical prisons in Japan are specialized in psychiatry (Nomura, 2009). The director of the designated facility confirms the continuity of hospitalization every six months (Ministry of Justice, 2012). He or she also asks permission to the District Court in order to discharge the mentally ill offender (Nakatani, 2012). Through a hearing, the Court decides whether a patient can be released or not. 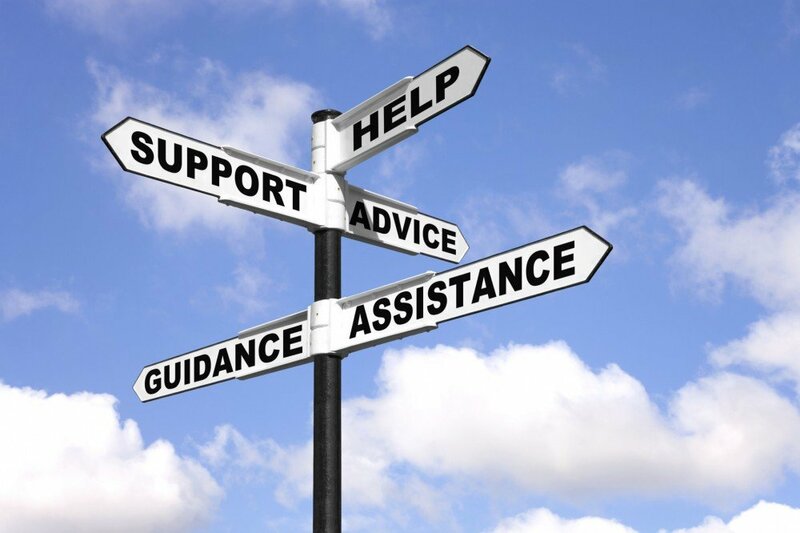 Outpatient treatment requires a collaboration of various institutions such as designated outpatient facilities and local health and welfare agencies (Nakatani et al., 2010). 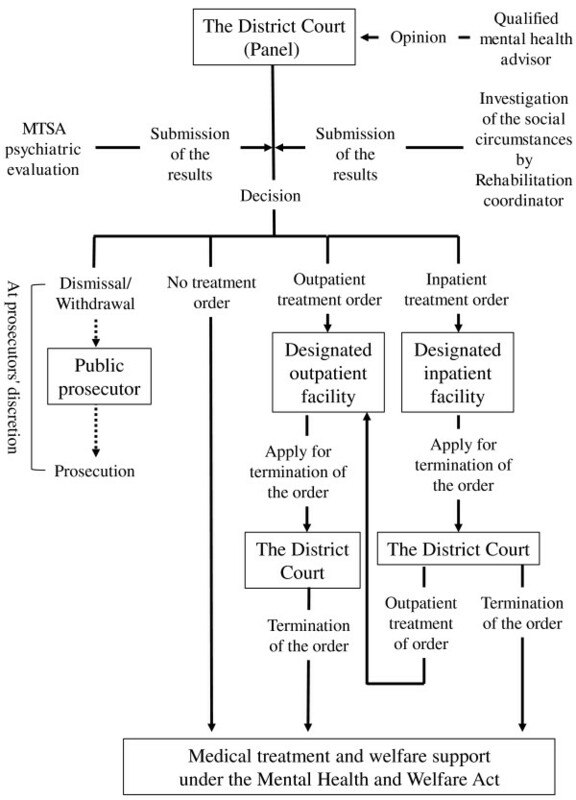 When the Court orders an outpatient order, the patient is placed under the probation office’s mental health supervision. The director of the probation office defines a plan for every mentally ill offender and assigns rehabilitation coordinators. The expected length of the treatment is three years but can be prolonged with an additional two years. The director of the probation office asks permission to the District Court in order to conclude the outpatient treatment, or to hospitalize the mentally ill offender in case his condition worsens (Nakatani, 2012). The court decides after conducting a hearing (Ministry of Justice, 2012). In March 2008, there were no less than 260 designated outpatient facilities (Matsubara, 2008). By 2014, this number rose to 452 facilities (Fujii et al., 2014). Although the Medical Treatment and Supervision Act was successfully enacted, the implementation is still in its infancy. In today’s forensic health literature, scholars recognize serious problems that hinder an adequate treatment of mentally ill offenders. Firstly, it appears that personality disordered offenders are hardly appointed a treatment order. The same applies to offenders whose treatability is doubtful. As a result, the number of treatment orders for insane offenders in Japan is remarkably low compared to other countries (Nakatani, 2012). This number remains stable, although more inmates have been diagnosed with mental disorders (e.g. schizophrenia) in recent years (Nakatani & Kuroda, 2013; Nomura, 2009). Secondly, human and financial resources for outpatient treatment prove to be insufficient. Next to that, rehabilitation coordinators are not given enough authority in crisis situations (Nakatani, 2012). Furthermore, a regional gap in inpatient as well outpatient designated facilities can be observed (Fujii et al., 2014). Thirdly, the foreseen length of stay for inpatient treatment is too short in most cases, which leads to overpopulation of mental health facilities (ibid.). Fourth, when an offender – suspected to be ill – stands trial according to a jury system, it could be difficult for lay judges to grasp the psychiatric context of the offense (Moriya & Ujiie, 2008). Fifth, it is observed that thirty percent of mentally ill offenders are addicted to methamphetamines or to other kind of drugs (Imamura, Matsumoto, Kobayashi, Hirabayashi & Wada, 2010). This extends the length of recovery (Nakatani & Kuroda, 2013). Sixth, psychiatric personnel appear to be understaffed. In April 2007, only 26 full-time psychiatrists were employed in Japanese forensic institutions (Nakane, 2007; Kuroda, 2008). As a result, refractory patients, frequent among mentally disordered, are not treated properly. 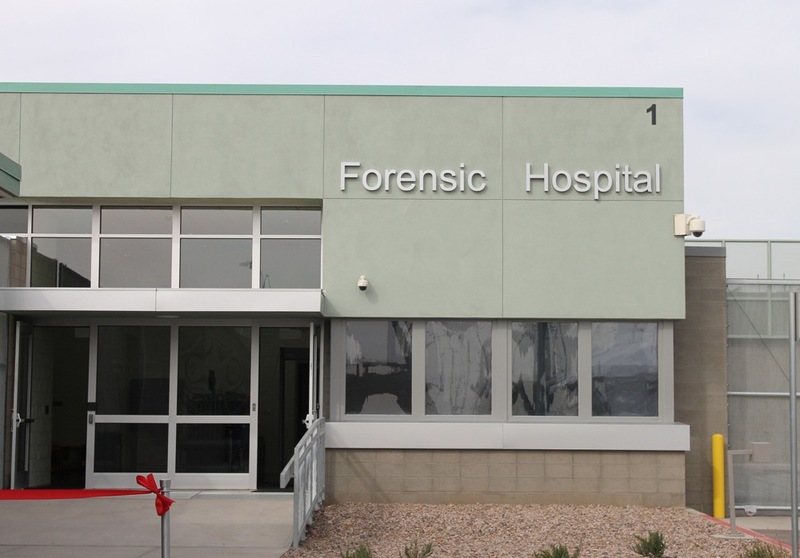 Psychiatric personnel are also rather unwilling and reluctant to work in forensic hospitals (Nakatani & Kuroda, 2013). 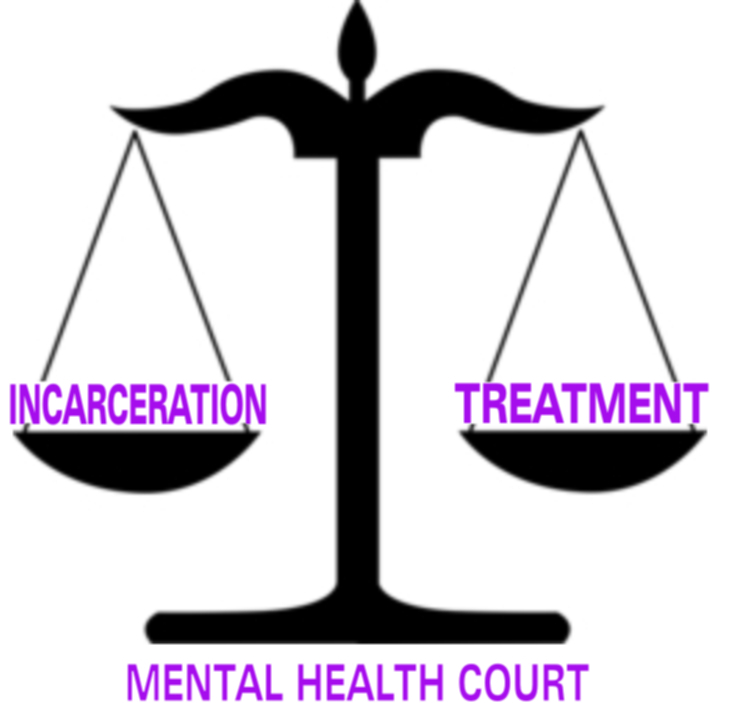 Seventh, once incarcerated, it remains very difficult for offenders whose mental condition worsens, to be transferred to a specialist institution. Similarly, mentally ill offenders are rarely released on parole, because they have difficulty expressing the motivation necessary for such release (ibid.). Eighth, not enough attention is paid to death row inmates, who tend to develop mental disorders (ibid.). Ninth, no significant change in attitude towards forensic mental health is noticed (Shiina, Okita, Fujisaki, Igarashi & Iyo, 2013) after the enactment of the Medical Treatment and Supervision Act. 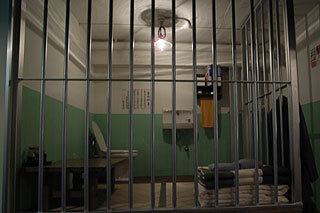 Mentally ill offenders appear to be stigmatized twice in society. Tenth, there exists no formal framework for psychiatric practice. Therefore, psychiatrists develop their own way of dealing with mentally ill offenders (Weisstub & Carney, 2005). Eleventh, the treatment of mentally disordered offenders is often cut off when they are released after having served their sentence (Nomura, 2009). When this implies a risk of recidivism, the director of a designated facility notifies the prefectural governor and asks for an involuntary hospitalization order. Local authorities, however, seldom carry out this order (ibid.). Twelfth, offenders of less serious crimes are not covered by the Medical Treatment and Supervision Act and are often incarcerated with minimal psychiatric assistance (Odagaki & Toyoshima, 2010). Some scholars believe the advantages of the Medical Treatment and Supervision Act do not equal its advantages and call for an abolishment of the act (Nakajima, 2011). Others are less radical but still emphasize the need for a thorough revision of the Act (Odagaki & Toyoshima, 2010). Although the Act was slightly adapted in 2006, the scheduled revision for 2010 did not take place. The fact that the Act is not yet widely known could also be an explanation for the lack of international criticism (ibid.). The new system is a unique but limited combination of forensic and general psychiatry. This way of dealing with the mentally ill already faces many challenges, and it will not take long before the Medical Treatment and Supervision Act is revised. citation of this article: Van Enis, Ann-Sofie. “The Medical Treatment and Supervision Act (2005): Forensic Mental Health in Japan Today.” Nippaku, January 20, 2015. https://nippaku.wordpress.com/. The offender, however, was attributed full responsibility and was sentenced to death. Including the Japan Association of Psychiatry and Neurology, the National Federation of Families with Mentally Ill in Japan and the Japan Federation of Bar Associations (Japan Times, 8 June 2002). 「許容しがたい人権侵害をもたらす」said president Kazumasu Kuboi (Asahi Shimbun, 16 March 2002). 心神喪失等の状態で重大な他害行為を行った者の医療及び観察等に関する法律 （略:医療 観察法）in Japanese (Moriya & Ujiie, 2008). 入院処遇 in Japanese (Moriya & Ujiie, 2008). The stay of 144 (33.2%) mentally ill offenders was prolonged. In general, forensic patients stay longer than non-forensic patients in mental health facilities. Designated by the Minister of Health, Labour and Welfare. 通院処遇 in Japanese (Moriya & Ujiie, 2008). Only 1,1% of mentally ill offenders treated according to the Medical Health and Supervision Act is diagnosed with a personality disorder. The reason is that most of them are found guilty and fully responsible, eliminating the possibility of being referred to the Act (cf. supra: Osaka school massacre) (Fujii et al., 2014). At the end of 2013, no designated inpatient facility existed in Hokkaidō and Shikoku (Fujii et al., 2014). Compare this to Belgium, where 32 full-time psychiatrists and 147 full-time psychologists were employed in June 2006 (Salize, Dreßing & Kief, 2007). For the course “Politics, Law and Society in Japan: A Global Perspective” I wrote a paper about Japanese forensic mental health, focusing on the Medical Treatment and Supervision Act, implemented 10 years ago. I will post this paper in two parts. The first part deals with the historical background and how and why this Act was established. The second part gives a short overview of the functioning of the Act and summarizes the challenges the Act already has been faced with. How mentally ill offenders are treated has always been a difficult issue to deal with, for the reason that they are situated in a double paradigm: on the one hand they have committed a crime and are therefore offenders; on the other hand they are deemed to be ill and should receive treatment. According to article 39 of the Japanese Penal Code, enacted in 1907, “an act of insanity is not punishable and an act of diminished capacity shall lead to the punishment being reduced” (心神喪失者の行為は、罰しない。心神耗弱者の行為は、その刑を減軽する). The Penal Code, however, does not provide any measurements to treat mentally ill offenders acquitted due to their disorder. Only until recently, forensic mental health was covered by general health treatment. In fact, no special system existed for such offenders, making Japan unique in that way. As a result, mentally ill offenders were treated either in prison when convicted or in general psychiatric hospitals. In July 2005, the Act for the Medical Treatment and Supervision of Persons with Mental Disorders Who Caused Serious Harm (shortened to “Medical Treatment and Supervision Act”) (心神喪失等の状態で重大な他害行為を行った者の医療及び観察等に関する法律 （略:医療 観察法)) was enforced and brought about radical changes. For the first time, the act aimed at the rehabilitation and the right medical treatment of mentally ill offenders. The system established two different types of treatment: inpatient and outpatient treatment. Where previous acts were mostly highlighting the fear of recidivism, the act of 2005 specifically encourages reintegration of mentally ill offenders in society. While the enactment and transition went smoothly, Japan is still struggling with optimizing outpatient treatment. Traditionally in Japan, a mental disease was not regarded as a medical problem but as the possession of an individual by evil spirits, which could therefore only be treated by exorcist rituals like purification, incantation or shamanist treatment (Mandiberg, 1996; Russell, 1988). 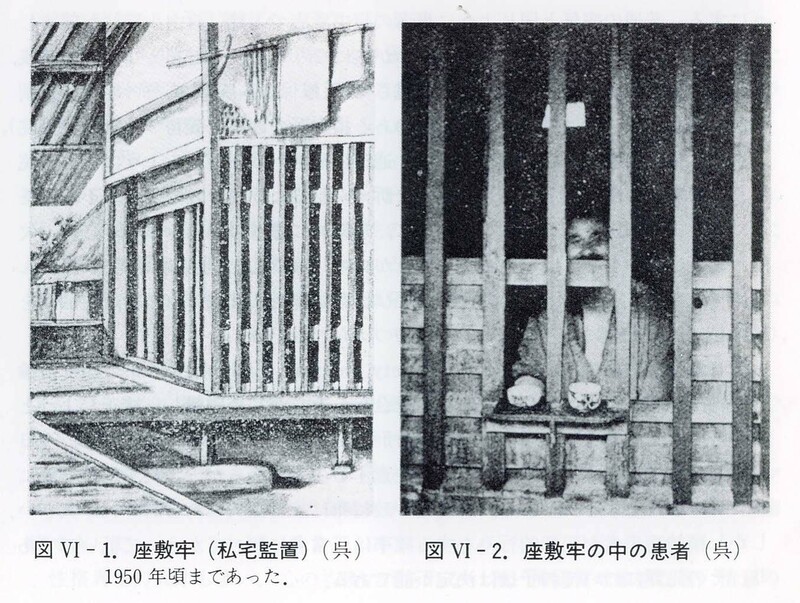 The construction of a confined room at the family home to lock up lunatics (zashikirō 座敷牢 (Mandiberg, 1996), nyūkan 入監 (Salzberg, 1991)) was a common tradition until the 20th century. The mad could also resort to Buddhist or Shintoist temples and shrines, sometimes resulting in rural communities around these places of refuge for the mentally diseased, and stimulating the reintegration in society. The Iwakura village near Kyoto was one of these pilgrimage and refuge places. Later in 1884, it transformed itself from a community of boarding houses where farm families cared for mentally diseased, into a successful private mental hospital until its closure in 1945 (Nakamura, 2006). 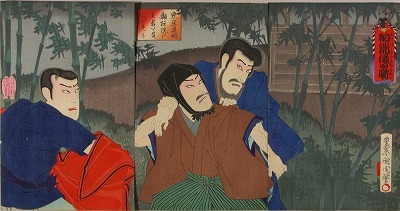 During the Edo period (1603-1868), the family head became heavily responsible for the conduct of his family members, and could end up being severely punished for the criminal acts of mentally ill diseased. As a result, mad people were ostracized by removing their name from the family register or confined, whether it was at home, at a temple or in a public prison (nyūrō 入牢) (Russell, 1988). 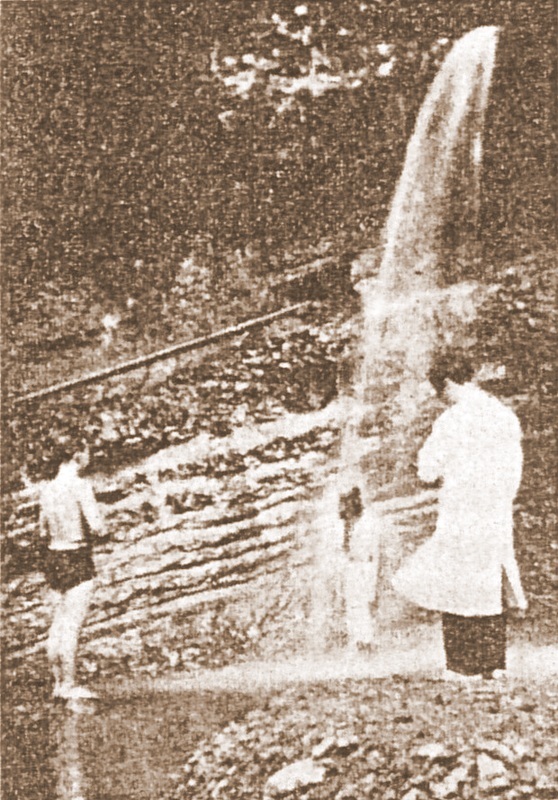 When the proper supervision of mentally ill individuals became impossible, they were often confined with medical care under supervision of eta (tameazuke 溜預) (Yamazaki, 1931). Nevertheless, home confinement was still the primary way of dealing with lunatics. On the one hand, it should be noted that these provisions were not established for the good of the mentally ill, but rather seen as a necessary measure to maintain social order. On the other hand, the traditional perception of mental diseases altered under the influence of Western medicine and philosophy, brought to the isolated isle by Dutch physicians during the 19th century. Compared to the inhumane imprisonment and traumatizing rituals, they introduced new concepts of psychiatric therapy, which were later put into practice by Japanese students of Western medicine. Both perspectives were developed further during the Meiji Period (1868-1912). Rapid social change compelled the Japanese government to issue laws concerning the attitude towards the insane. A circular in 1878 established certain rules for confinement of the mentally ill: imprisonment at home required a report of a physician and an official request of the family. Those disowned by their family were confined to detention centers (Salzberg, 1991). Because mentally ill individuals were considered as possibly dangerous subjects for society, a series of police orders stipulating the control and punishment of the insane followed (Kuwabara & True, 1976). A law in 1884 stated that mentally ill could only receive treatment if a doctor appointed by the police had examined them. When successfully confined, police authorities checked the patients once in a month. At the same time, however, a critical stance towards confinement and incarceration urged the demand for proper treatment centers. 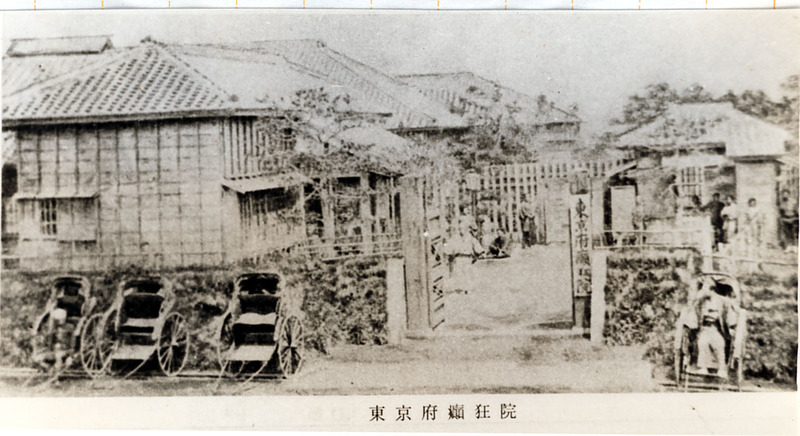 The first mental hospital in Kyoto was established in 1875 (Nakamura, 2006). One specific case drew particular attention to the necessity of a mental health law. The daimyō of Sōma prefecture, Sōma Tomotane, at the time involved in a family dispute, was declared to be schizophrenic and thus confined to a zashikirō. Loyal retainers believed this was a conspiracy of the other family members against their lord. They kidnapped the daimyō from the psychiatric hospital he had been transferred to and made the details about his confinement public. This was largely covered in the media, including international newspapers. As it became clear that formal mental health regulations were yet to be established, the Meiji government feared the Sōma affair would undermine their long-fought efforts to develop Japan as a modern state (Russell, 1988). As a result, The Law for the Custody and Care of the Mentally Ill was enacted in 1900. With this law, families were officially permitted to build zashikirō and were kept legally and financially responsible for their supervision and the actions of mad family members. The law was presented as a protection against illegal and arbitrary confinement, but in fact encouraged traditional and outdated practice. Again, the government’s main concern was public safety and order (Mandiberg, 1996). Up till now, I have only discussed the attitude towards the mentally ill in general. This is simply because there were no special measurements separating mentally ill offenders from normal offenders. Insane individuals were prevented from committing crimes by incarceration or confinement (‘punitive treatment’) and did not receive medical assistance. Moreover, physicians were rarely involved in mental health treatment. The responsible family members were still forced to rely on shaman rituals, combined with familial care. We can see this as a type of community psychiatry, though very primitive and non-therapeutic (Kuwabara & True, 1976). A survey, conducted by the government in 1915, indicated that 82% of mentally ill individuals were untreated. Hence, the Law for the Custody and Care of the Mentally Ill was supplemented with the Mental Hospital Act of 1919. This act, again for the sake of public safety, regulated compulsory confinement in a psychiatric hospital, under permission of the state or responsible family members. Nevertheless, most mental patients were still confined at home, taken into account that by World War II, only six public insane asylums had been built in Japan. The government had decided to fund mainly private mental hospitals, whose treatment only rich families could afford (ibid.). 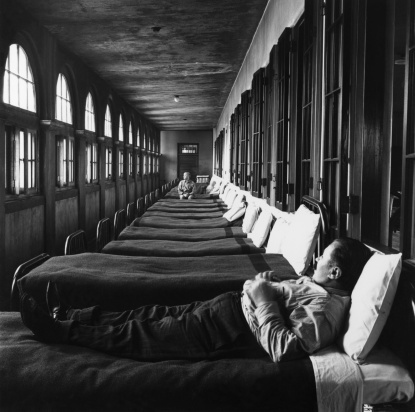 The limited number of beds dropped during World War II, when the mentally ill were neglected and died of starvation due to the National Eugenics Act of 1940. In 1950, opposition groups expressed concern for the proactive detention mentally ill people were subjected to. The Mental Hygiene Law was enacted, abolishing home confinement and demanding the establishment of prefectural psychiatric hospitals. Mental diseases were acknowledged as medical problems that required appropriate treatment. However, households remained legally and financially responsible for the acts of mentally ill family members. The law defined three types of hospitalization when a certain degree of danger for the insane himself and his environment could be observed: compulsory or provisional compulsory admission ordered by the prefectural governor, and compulsory admission requested by the legal guardian. Still, the fact that no consent from the patient was needed was seen as a contradiction to the Constitution (Kunihiko, 1991). Once admitted to a mental hospital, there were no provisions to review the decision for another type of hospitalization, and few people were ever discharged. At the same time, options for community placement were very scarce (Mandiberg, 1996). During the 1950s and 1960s, the number of psychiatric beds rose significantly. Criminal offenders deemed mentally ill were now often hospitalized instead of incarcerated. Consequently, more facilities were needed. 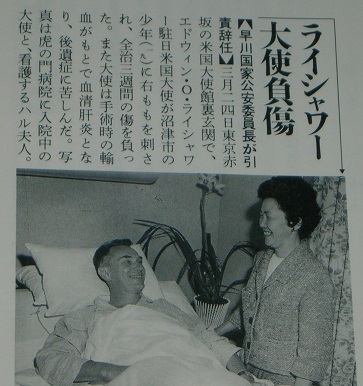 This became clear in 1964 when a schizophrenic young man assaulted Edwin Reischauer, the American ambassador to Japan. On that account, the Japanese police authorities requested more powerful action against the mentally ill (Koizumi & Harris, 1992). This request was turned down, and instead more outpatient and community services were stipulated in the Revised Mental Hygiene Law of 1965 (Nakatani, 2012; Kunihiko, 1991). It has to be noted, however, that forensic health still did not differ from general mental health. Again, the 1965 law was implemented to maintain social order, and not to effectively help the mentally ill. In the 1980s, scandals lead to the establishment of the Mental Health Law (1988) that emphasized the importance of human rights and rehabilitation (Nakatani, 2012). For the first time, the legal rights of the mentally ill were acknowledged and a Psychiatric Review Board reviewed their hospitalization (Cohen, 1995). Although this model was implemented, it appeared impossible to be carried out accordingly (Mandiberg, 1996). The Mental Health and Welfare Act replaced the Mental Health Law in 1995. This law mainly stipulated the increase of outpatient facilities, welfare services and participation in community (Kunihiko, 1999). As these amendments were hardly applicable to mentally ill offenders, only few psychiatrists were inclined to work in forensic health treatment (Nakatani, 2012). In 1999, a White Paper of the Ministry of Justice pointed out these problems. Public prosecutors, who were more likely to file a report to the prefectural governor in case they assumed criminal responsibility, only indicted a small number of mentally ill offenders. A medical examination was subsequently carried out. If the assumption was verified, the prefectural governor commanded an involuntary admission. Although this procedure assured quick treatment for acquitted mentally ill offenders, the chance to stand trial was minimalized. Furthermore, general mental health hospitals often did not have the required security to receive criminals. 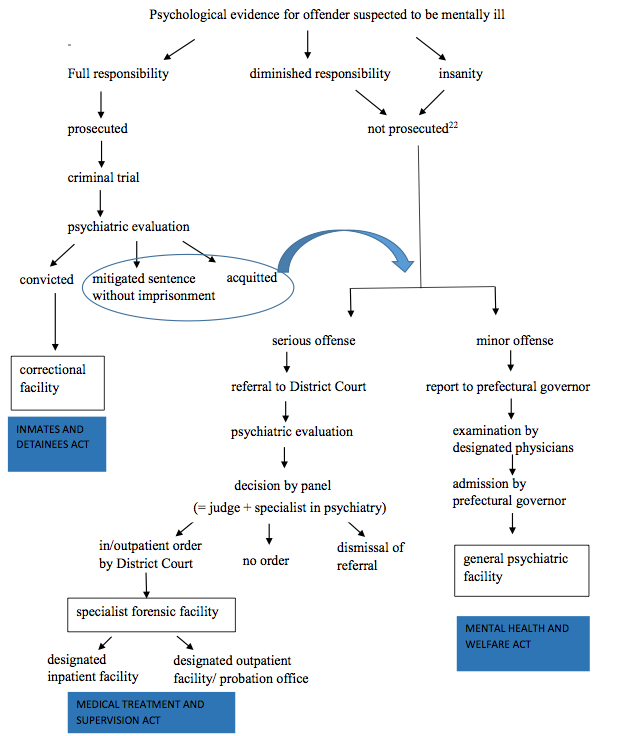 In addition, psychiatrists carried a heavy responsibility, as they had to decide about the discharge or continued confinement of the patient, considering the possibility of recidivism (Nakatani, 2000). The second part will give a short overview of the functioning of the Act and will summarize the challenges the Act already has been faced with. The treatment by shamans or monks was often very expensive. Hence, rejection of the mad family member became a common practice (Official Order of the Kyoto local government, No. 325, July 25, p. 187, cited in Kuwabara & True, 1976). Mandiberg (1996) compares this to the city of Gheel in Belgium, whose concept of ‘family care’ inspired the Iwakura hospital, an ambition that never came true (Hashimoto, 2014). 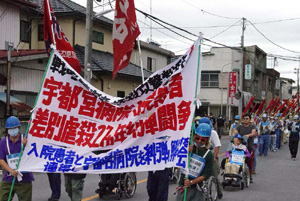 Because of the institutional gonin-gumi system (五人組), a group of five households shared collective responsibility. The eta穢多, burakumin部落民 or hinin非人 was an outcast group because of their impure or death-associated occupation. Together with the mad, underage and extremely ill offenders were supervised as well in these special detention centers (Salzberg, 1991). 精神病者監護法 in Japanese (Moriya & Ujiie, 2008). Department of Welfare, Bureau of Medical Administration (1955), cited in Kuwabara & True, 1976. 及び精神病院法 in Japanese (Moriya & Ujiie, 2008). 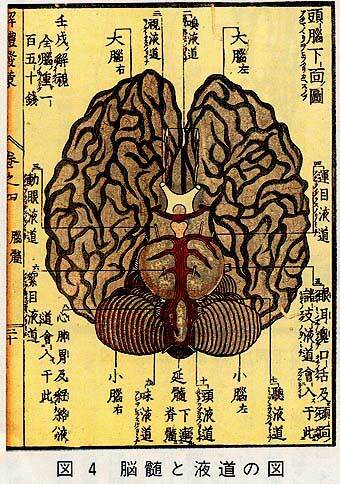 In 1941 there was place for 24,000 mental patients all over Japan. By 1945, only 4,000 beds were left (Russell, 1988). The Iwakura Mental Hospital was forced by the Japanese army to close his doors (Nakamura, 2006). 国民優生法In Japanese. Available at http://www.res.otemon.ac.jp/~yamamoto/be/BE_law_04.htm, accessed on 29 November 2014. 精神衛生法 in Japanese (Encyclopedia Nipponica online, accessed on 29 November 2014). 精神衛生法改正 in Japanese (Moriya & Ujiie, 2008). In 1984, two patients died by abuse in The Mental Hospital of Utsunomiya. Further research disclosed that over three years, 222 of the 1,000 patients hospitalized there had died in suspicious conditions (Jakopac & Patel, 2009). The United Nations Commission on Human Rights criticized Japan’s mental health system (Gostin & Gable, 2004). 精神保健法 in Japanese (Moriya & Ujiie, 2008). “Few patient-initiated PRB review applications are filed, and the few of those that are filed result in recommendations for discharge or change in treatment” (Mandiberg, 1996). 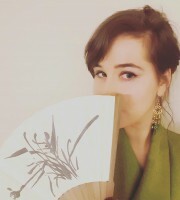 精神保健福祉法精神保健および精神障害者福祉に関する法 in Japanese (Moriya & Ujiie, 2008).